The Biritish Virgin Islands Tourist Board has issued an official assessment on the category 5 Hurricane Irma, that had passed through the British Virgin Islands Wednesday, September 6th at around 2:00 pm AST. 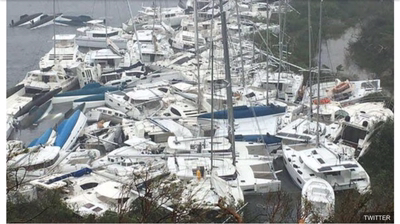 At least 10 people have been killed as the storm barrels its way across the Caribbean. Irma has destroyed everything in its path with multimillion pound properties belonging to Donald Trump and Richard Branson reportedly hit and luxury homes owned by Bruce Willis, Roman Abramovich and Keith Richards all in the killer storm’s way. Virgin boss Mr Branson’s Necker Island suffered the full-force of Hurricane Irma and the billionaire has reported widespread damage to the island. He rode out the hurricane in a wine cellar in one of the properties on the island. Reports show that the storm hit the territory directly. While the full extent of the damage is unknown at this time, it is clear the islands have been severely impacted. At present most communications remain down, including mobile phone service and internet access. For the time being, this will make it difficult for those trying to reach the territory in order to connect with family and friends. The Government has begun to coordinate humanitarian relief efforts and an initial clean-up operation. The BVI London and New York offices will remain in contact with the Government to receive information as it becomes available. As we further assess the damage caused by Hurricane Irma, we will issue additional statements.